HCJFS Director Moira Weir speaks at the Freestore Foodbank on Monday. 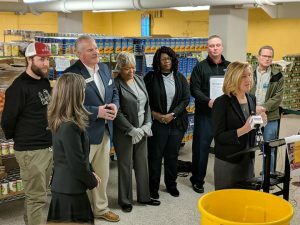 Hamilton County Commissioners today announced a county-wide Food and Fund Drive to stock the Freestore Foodbank so it can be ready to help local pantries with an expected surge in food assistance requests during February and March. 100,000 Hamilton County residents rely on SNAP (Supplemental Nutrition and Assistance Program) food assistance. The federal government shutdown resulted in early issuance of SNAP benefits in January to last into March, instead of the typical February load.